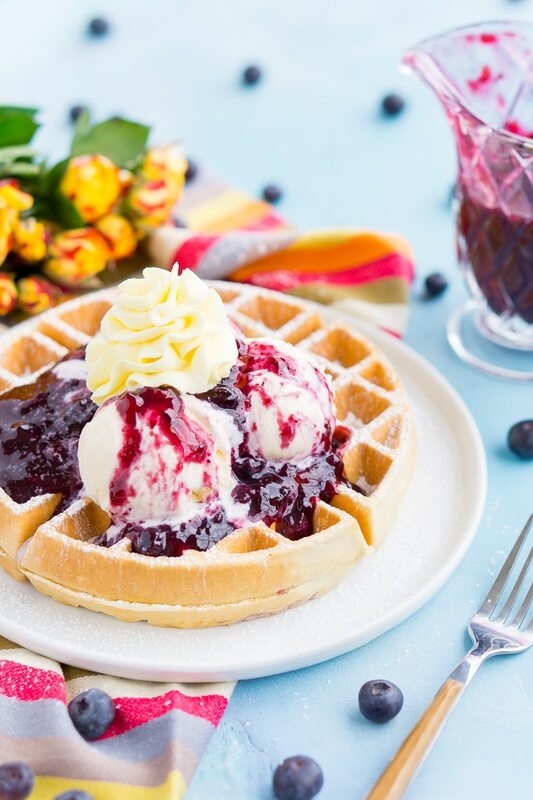 Belgian Waffles with Mango Blueberry Compote are a flavorful and fun brunch dish! 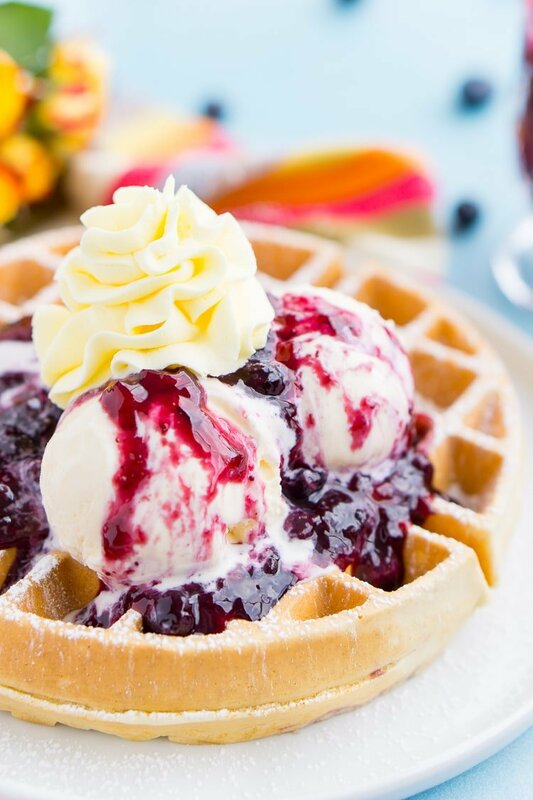 Fluffy waffles, vibrant wild blueberries, and luscious mangoes, topped with ice cream and whipped cream! 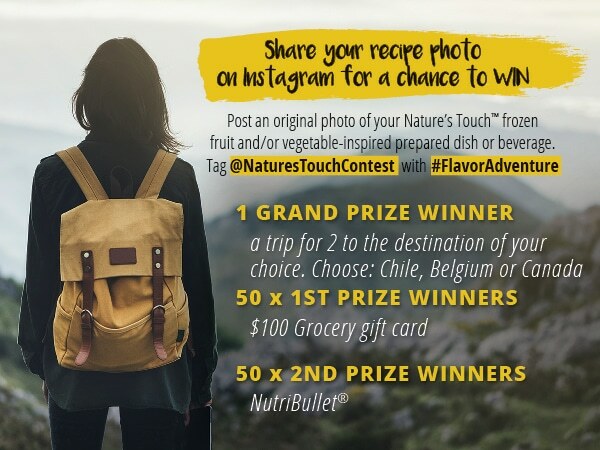 PIN IT TO YOUR BREAKFAST BOARD ON PINTEREST! You’d be hard-pressed to find someone that doesn’t love a late, lazy Sunday brunch with all the fixings. Whether you’re eating at your favorite local spot or pouring mimosas at home, this late-morning meal is popular for a reason: all that warm, comforting food! As much as I enjoy tasting new dishes at restaurants, my favorite place to be on a Sunday morning is at home, in my pajamas. But that doesn’t mean I skip brunch! Instead, I take those slow, calm hours — which are often the most relaxing part of my week — and I have fun trying out some new recipes for our late-morning meal. Here’s the tricky part about brunch: it has to include the traditional staples, but eating the same things week after week can get boring. I always make sure to cook up bacon, eggs, and pancakes or waffles, but I try serving them with an exciting, fresh twist. This Sunday, I made Belgian waffles (Matt’s favorite) but wanted to serve them with something other than maple syrup. So, I concocted a compote using the frozen pesticide-free mangoes and wild blueberries from Nature’s Touch that I had stocked in my freezer. I get mine from Shaw’s and keep my freezer stocked This helps on lazy Sundays, saving me a trip to the store and having fresh and tasty fruit ready when I need it! 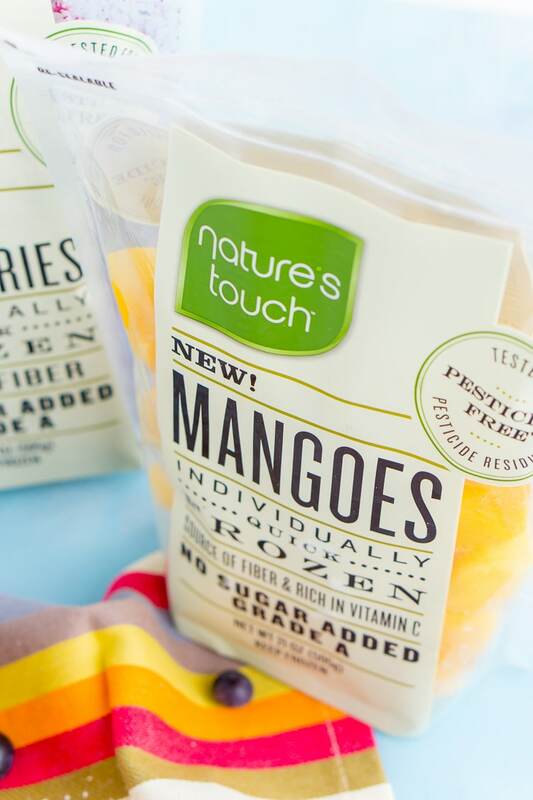 Lately, I’ve been getting creative with Nature’s Touch pesticide-free frozen fruit, my new brand of choice. Some varieties are organic and they also have vegetables, but all their products contain “farm to table” quality. I always have a few bags of frozen fruit on hand for those times when I need to make a sweet recipe or snack in a pinch. As much as I love fresh fruit and berries, they tend to go bad quickly, so this is a convenient option that ultimately saves me money. What’s more, Nature’s Touch Pesticide-Free and Organic products taste great and I can get them right at my local Shaw’s! 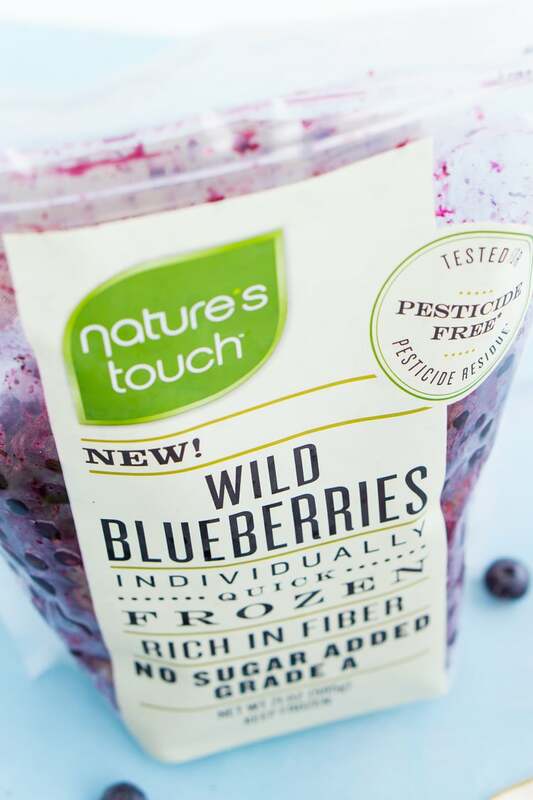 Being from Maine, I can be somewhat of a blueberry snob, but I can honestly say that this brand has the best frozen wild blueberries that I have ever tasted. Now, they’re the only kind of frozen blueberries I’ll ever use while I’m cooking! 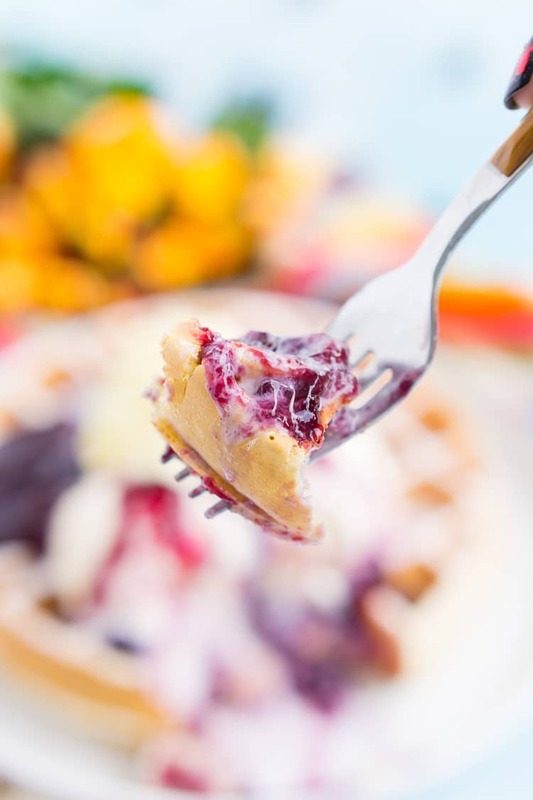 That’s how they inspired my new recipe for Mango Blueberry Compote, a decadent topping to add some flavor to your Sunday waffles. 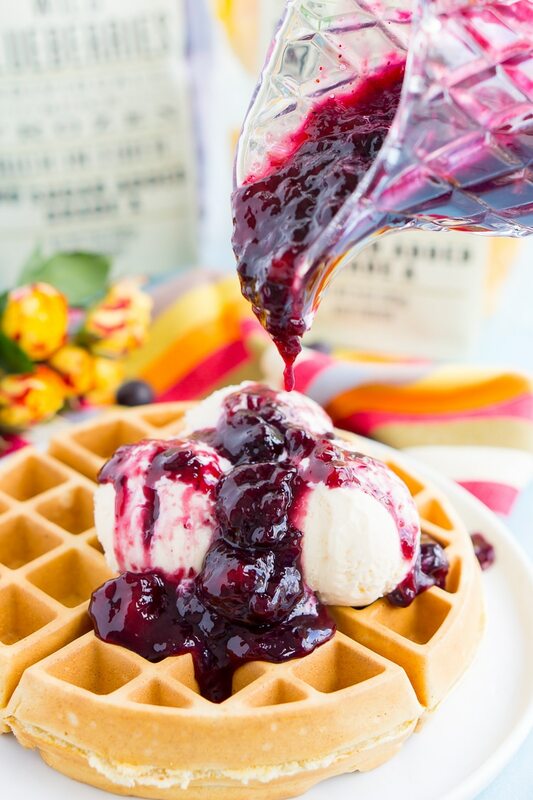 In this recipe, luscious chunks of mango are blended with big, juicy blueberries for a fruity sauce that’ll make you forget all about the maple syrup. If you really want a decadent, dessert-like dish (hey, why not?!) add a couple scoops of vanilla ice cream to your plate. We tried it this weekend, and man was it good! It’s basically Belgian waffle à la mode: the waffles were crispy and golden on the outside, fluffy on the inside. We topped them with vanilla ice cream, followed by a few pours of warm Mango Blueberry Compote. 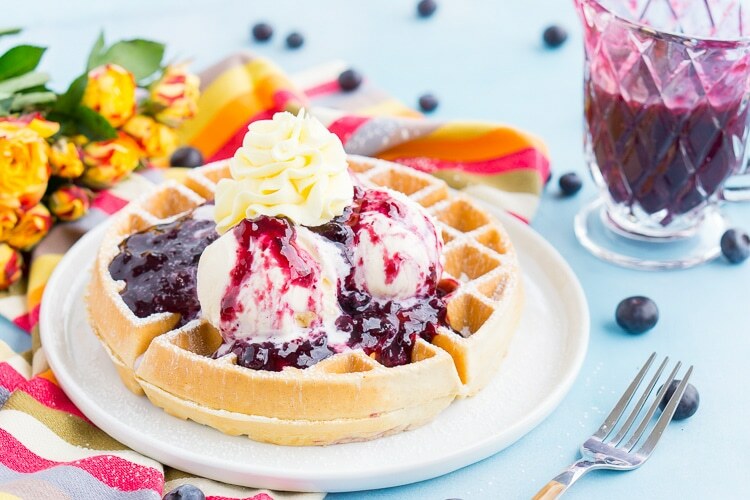 The fruity sauce and ice cream melted together in the pockets of the waffle, and it was absolutely delicious! I’m already looking forward to making these again when Sunday rolls back around. 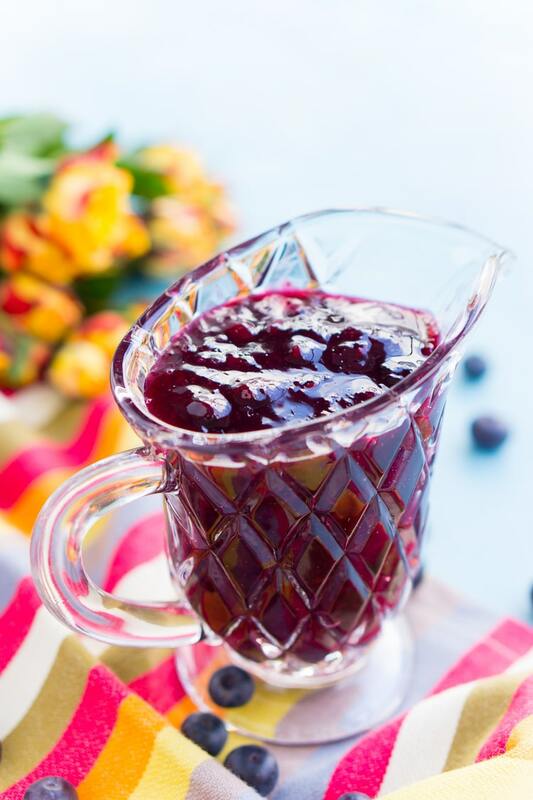 Along with orange juice, coffee, and butter, Mango Blueberry Compote is our new must-have item on the brunch table. I can’t wait to try it on pancakes and French toast, too! Leave the syrup in the pantry, because once you try this sumptuous sauce, you won’t want anything else on your favorite breakfast foods. Sift together flour, baking powder, and salt in a medium bowl and set aside. In a second bowl, beat together the egg yolks and sugar until sugar is completely dissolved and eggs have turned a pale yellow. Add the vanilla extract, melted butter, and milk to the egg and sugar mixture and whisk until combined. Combine the mixed wet ingredients with the dry ingredients and whisk just until blended. Do not overmix. In a third bowl, beat the egg whites with an electric mixer until soft peaks form, about 2 to 3 minutes. Using a rubber spatula to fold the egg whites into the batter. Do not overmix! Close and cook as per manufacturer's instructions until golden brown, about 2 to 5 minutes. Add frozen blueberries and mangoes to a large pot and heat over medium-high until blueberries break down and mangoes become soft, about 10-15 minutes. Stirring occasionally. Bring fruit to a light boil, stir in sugar, and return to a boil. In a separate small bowl, whisk together corn starch and water and pour over the fruit. Stir the mixture vigorously for 1 minute and then remove from heat and let cool and thicken, stirring occasionally. Bottle up and store in the fridge or freezer, or use right away on the waffles. 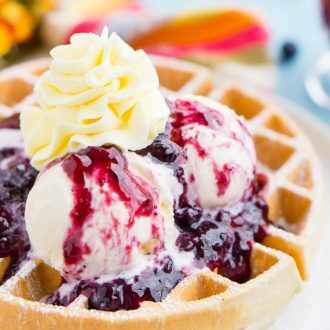 Top the waffles with vanilla ice cream and whipped cream if desired. If you store in the freezer, only fill about 3/4 of the jar. The filling should keep in the freezer for 3-4 months, or in the fridge for about 1-2 weeks. Reheat in the microwave to soften back up, you may need to add a little water to reach desired consistency. These look delicious! 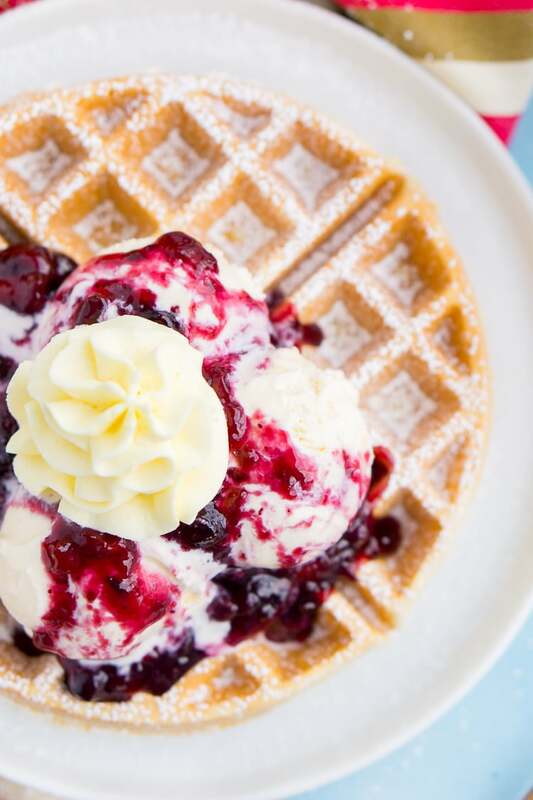 What waffle maker are you using? I’ve been looking for one that makes these perfect Belgian waffles but don’t know what brand will make them come out that thick. Hey Jen! I use this waffle maker: http://amzn.to/2oD4MrN I’ve had it for almost 2 years now and it yields beautiful Belgian waffles with deep wells for lots of syrup 😉 I’ve tried several brands over the years, but this is the one that has last and performed the best. Thanks Rebecca! I’m in the market for one but wanted one that made those thick Belgian waffles!